I took a break from work today to enjoy this gluten-free lunch out on my front porch while soaking up some sunshine for 30 minutes. The day is a perfect sunny 68 degrees. I threw together this healthy meal in 10 minutes! When I am too busy to actually cook a meal and follow a recipe (most days at lunch) I like having some healthy options I can throw together for a meal packed with nutrition using some of my favorite ingredients. I like to use this method for lunch and dinner . . . . . choose your Protein, Vegetables, Starch and Fat or PVSF. Then I might add in a sweet treat like a crisp apple and a fresh picked raspberry! This meal will keep me full and optimize my mental clarity and energy all afternoon. * I start most meals with some lemon juice in room temperature water to help my stomach produce acid and enzymes needed to break down my food. Sometimes I use Braggs Apple Cider Vinegar (ACV) instead of the lemon juice. Think about a lemon. Notice how your mouth will start salivating. Saliva has important digestive enzymes that will help break down your food so you can benefit from it. This is a common tip I give my clients. Step 2: Transition to the meal. This is form of mindfulness and gratitude. I help my body transition from sympathetic nervous system activity (think stress, movement, fight or flight mode) to parasympathetic nervous system activity (think calm, rest and digest) by pausing to look at my food and taking five breaths or acknowledging appreciation for my food. Step 3: Support digestion and absorption. I always start with a couple of bites of protein to help stabilize my blood sugar. This is a tip I give my pre-diabetic and diabetic clients. I recommend chewing each bite until the food in your mouth is a ball of mush. This starts digestion by mixing food with saliva and breaking down the food into smaller particles. 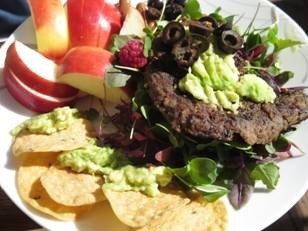 I hope this short blog inspires you to take a few minutes to make a quick, nutrition-packed lunch! 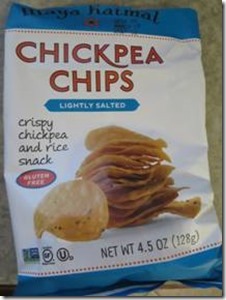 Note: here are some new chips I am trying out. I picked these up on sale for $2.85 at Natural Grocers. I don’t eat wheat (celiac disease) so I like that these are GF. 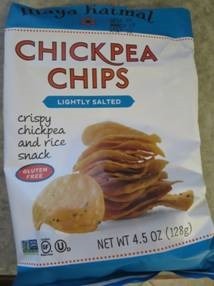 I don’t eat corn chips because I don’t feel well when I eat them; Chickpea Chips are a decent alternative for me. I actually like them. My husband Craig, the real food critic in my family, says he doesn’t like the aftertaste . . . . . more for me! Great website with practicle ,usable content and easy to navigate.Best wishes for much success to a fantastic person!